"Stay Alert, Don't Get Hurt"
​in the CareerSafe National Video Contest. STEP ONE - Watch the amazing video Alyssa Smith & Sara Abushakra made above. STEP TWO - Click on the VOTE NOW button above. The VOTE NOW button takes you to the CareerSafe Voting Website. STEP FOUR - Make sure you click on "Stay Alert, Don't Get Hurt!" STEP FIVE - Click their blue Submit button. 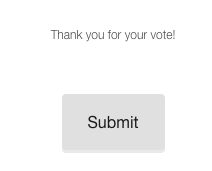 STEP SIX - Then Click the grey Submit button to make sure your vote goes through. ​Go vote as many times as possible!!! Get your friends and family to vote as well.